If you don't like to read bad reviews then I don't recommend you read this, but I'm not going to apologise for it; I can only be honest, and this is my honest opinion. I recently added Rachel McMillan's debut novel, The Bachelor Girl's Guide to Murder, to my TBR. I love historical crime fiction, and love it even more so when the protagonist is a woman. The Bachelor Girl's Guide to Murder sounds like everything I enjoy in the books I read, so when I found out it had an e-novella prequel, and one that was set at Christmas time at that, I had to read it. I'm sad to report I was sorely disappointed. Firstly, I don't think it's written well, nor do I think it's been edited particularly well. There was the odd spelling error - a case where 'gentleman' was used when it should have been 'gentlemen' - as well as inconsistencies such as the narrator, Jem, knowing another character's name despite the fact that she never shares it. Little things like that are easy to fix, and that's why it irritates me when they appear in published work. The novella as a whole was told rather than shown; we're never really introduced to anyone beyond a brief, vague sentence. I didn't feel like I was in Edwardian Toronto at all - there was practically no description and no sense of place whatsoever, and the Christmas setting felt like an afterthought. Christmas was only mentioned once or twice, and though the cold was sometimes mentioned I never felt it, so the entire novella could have taken place at any time of the year. I also don't think there was very much in terms of realism. As I mentioned above I didn't feel like I was in Edwardian Toronto, and parts of the story felt rather juvenile; Jem and Merinda sneak into what is effectively a sinister rehabilitation centre far too easily, and they seemed to take ages to come to what I thought were fairly obvious conclusions. There's a clear love for Sherlock Holmes here, and while I'm all for a female equivalent to Holmes and Watson I don't think Jem and Merinda are it. I really wanted to like this, and given the ratings on Goodreads so far I think I'm in a severe minority here, but I just didn't think it was very good. 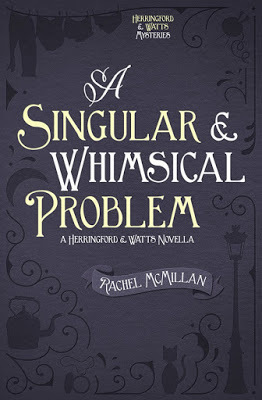 I hope McMillan's debut novel is better, though if it's anything like this I'm afraid I won't be reading it.